Nothing like a good headstart in the traffic. Been a while since we've featured a Copenhagen supermum. Here on a Sorte Jernhest cargo bike. 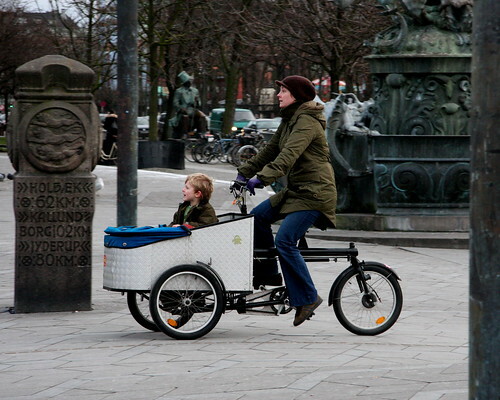 One of dozens of cargo bike designs you'll experience in Copenhagen. Yes, I like that head start rule. I do that here in America, but It's not legal, yet. I hear they have something like that in Portland. Wow, I was in Amsterdam last week and was BLOWN away by how the bike culture is there, and like Copenhagen I guess. The bike groups at quiting time were huge, often 30-40 people in a group all riding and making lights. No spandex in evidence. Only saw 2 "road/race" type bikes and both of those were at night being ridden but much faster than the average biker I saw. Tons of cool cargo bikes, bikes with kid racks on back, kid seats on the top tube, etc. And I guess I spotted about 5-6 mountain bikes total! Very different but very cool. Too bad my camera died earlier in my trip while in England (damn rain). Cheers and keep up the awesome photo's. Here in Portland, we have bike boxes that allow the bicyclist to go to the head of the line of cars stopped at a light. When the light changes to green, the bicyclist goes forward across the intersection and then back into the bike lane on the right side of the road. The purpose of the bike box is to prevent the sometimes deadly "right hook" when an oblivious car driver turns right in front of -- or over -- a bicyclist in the bike lane to the right. Each of those happened a year or so ago in Portland, leading to greater pressure for the fix. I'm curious: does Copenhagen/Denmark allow cars to turn right at a red light? I wish it were illegal here -- I don't know how many pedestrians and bike riders are injured each year by drivers turning right on red, but I bet it's in the thousands. Oh, and another great photo, by the way. you can see where the fight against these practices is taking us. Umindi those cars turnin' right, or you gonna get squished, brotha. 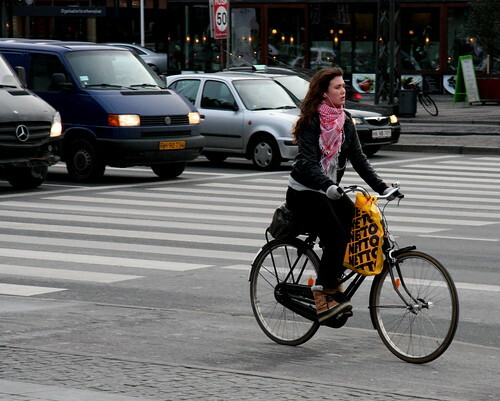 I've noticed that lots of Copenhagen bikes now seem to feature those clever Reelight dynamo thingies. Do you know if these are retrofits of a brilliant design, or new bikes coming with them fitted as standard in place of a bottle dynamo? See - I told you I was turning into a bikespotter! - red light turns for cars are not allowed in denmark. there is a campaign to make it allowed for bikes. - reelights are becoming standard on new bikes. - we don't have painted bike boxes like in portland, but at most intersections the stop line for cars is 5 metres farther back. and our traffic lights for bikes give us a headstart when they turn green. from 4 - 12 seconds, depending on the intersection.